Energy and power-generation and distribution companies face competition from renewable energy, de-centralised energy production and alternative energy sources such as solar, wind, geothermal and other technologies. In addition customer expectations within the industry are changing rapidly as access to the internet has enabled cost comparison websites and online only lower cost providers to emerge. The success or failure of players in this segment will depend almost entirely on how they respond to this relentless disruption. How Does an Industry Respond to Disruption? The word “disruption” is appearing on many SWOT analysis charts these days. Disruption may emanate from many sources including new technology, digitisation or changing values and customs within the buying community. The power-generation and delivery industry is facing disruption from all three of these elements in an unprecedented manner. New technologies abound. Photovoltaic production or solar energy is becoming increasingly efficient and competitive. Smart grid technology is helping utilities efficiently move power to where it is needed at the lowest possible cost. Digitalisation has invaded the speculative arena and the futures markets for the raw materials extracted from the earth to produce fuels for everything from power plants to race cars. Consumers are expecting the customer experience offered by utilities and other customer-facing elements of the industry to resemble the online experiences that are typical of other marketplaces. Buyers are also increasingly demanding a more earth-friendly industry. Clean energy and renewable energy are the preferred alternatives to the mine it, sell it, burn it model of power generation. The smokestack, once a symbol of prosperity and power, is now associated with pollution and irresponsible business management. Companies are investing in new technologies such as rooftop solar, high-efficiency turbines and wind-generated energy. There are many ways a company can respond to this level of disruption. For the power-generation and distribution industry, there are some ready-made tools available to guide and assist these enterprises in their response and transition. One such tool is Configure Price Quote technology, also known as CPQ. 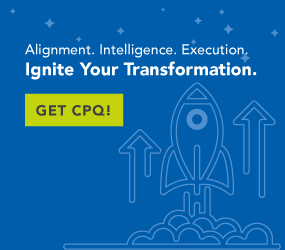 CPQ technology can help enterprises constrained by size, market complexity, regulatory burdens and product complexity become more agile and comfortable working with the complexity that defines their business landscape. Here are some examples. Nothing is more frustrating to a customer than being reminded month after month that they have no choice in picking their power-generation vendor. Further, they feel powerless by not having any impact on the selection of power sources in terms of green, renewable or alternative energy production. CPQ allows sellers to offer bundles of products and assorted alternatives such as green energy or power derived from alternative sources. The final price quoted to the customer is built around contractual pricing established with multiple suppliers featuring different mixes of traditional and alternative energy purchased. CPQ helps maintain and comply with contractual obligations to partners and translate those contracts into beneficial added value for the customer. We all love a customised product built specifically for our needs and requirements. CPQ helps the customer configure a solution derived specifically from their stated requirements. Perhaps they want multiple services such as cable, internet, water and trash services bundled into their monthly payment structure. CPQ delivers that type of customisation. For example; maybe the customer wants to buy green energy but, at the same time, doesn’t want to worry about paying a premium during high-demand times. CPQ allows the product to be structured to maximise the use of earth-friendly power but levels pricing out for high-demand consumption when required. Many customers expect to be able to go online and conduct most of the business they have with a company without the intervention of a human. They want to select the options, compare the pricing, make the choices, order their selections and make payments without talking to a service agent. CPQ empowers eCommerce solutions to work within a customer experience hub providing a single point of contact for all customers. They can access this facility to evaluate products, compare alternatives, select choices, pay for products and services and to request maintenance or other services. Power companies have many choices for purchasing power. Each contract will likely differ greatly in the terms and conditions affecting the business relationship with the supplier. CPQ provides the flexibility to maintain multiple sources with multiple benefits and obligations as defined by the contract with each supplier. This means the customer will be served with more choices, more flexibility and greater value. Regulatory compliance has long been a fixture within the power-generation and distribution marketplace. Regulations control virtually every aspect of doing business in this arena. The quicker and more completely you are able to comply and demonstrate compliance the less likely you are to find your company subject to audits and fines. CPQ builds the effects of regulatory compliance into the product-specification and pricing process. When a regulation goes into effect, it’s impact is already encoded into the CPQ rules affecting how products and prices are calculated. No misquotes, no illegal deals and no bureaucratic screw-ups over regulatory changes. This power-generation and distribution industry is on the cusp of great change. The playing field will no doubt look very different in just a few years. The players who survive this period of change will be those who adopt a customer focus and a commitment to delivering great value to the customer. CPQ is a great first step in that journey to the future.